Hello and welcome to The Collection Corner. 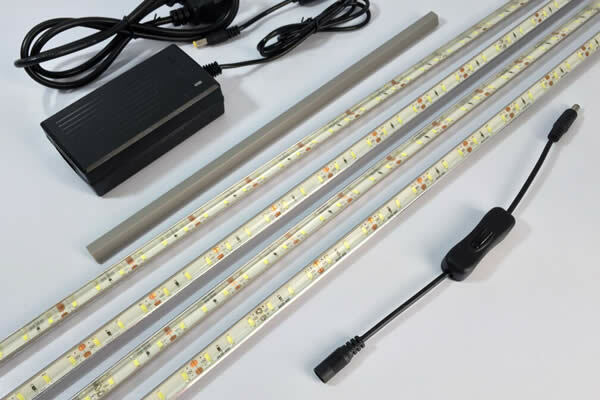 You’ve probably found me because you’re looking for LED lighting for your IKEA Detolf glass cabinet. 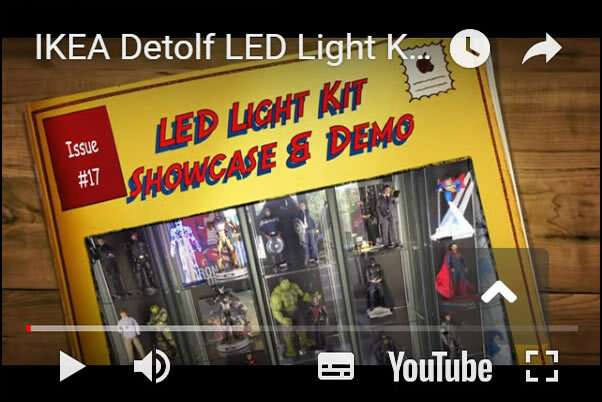 I have spent the last few years designing and hand building custom LED lighting for the IKEA Detolf display cabinet along with a whole host of other display units and facilities. I don’t know about you, but I prefer to have a nice clean display so the view of my precious collectibles is clear and unobstructed. If you’d like to chat with me about your display or other lighting requirements please get in touch with me. I personally collect mainly Hot Toys, which you may well be familiar with. 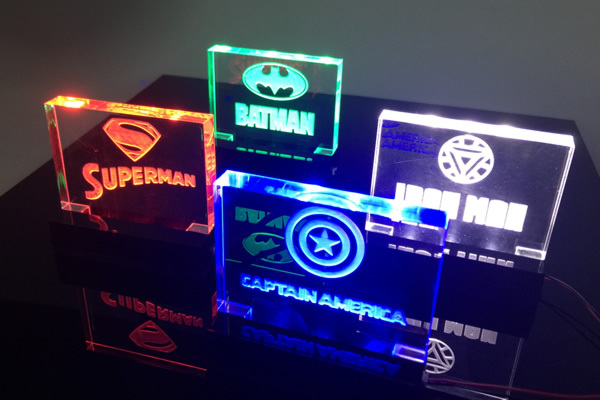 They are expensive, limited edition and highly detailed film character replicas. When it came to buying lighting for my first Detolf, I found that all the lighting on the market was cheap and very much ineffective. The wiring is left to be coiled around the framework and permanently on view, the low grade LEDs are uncovered so the poor lighting is left to glare in your eyes, detracting from the view of what it is that all that money was spent on in the first place. this left me with only one option, I needed to design and build my own lighting system to compliment my expensive collection. 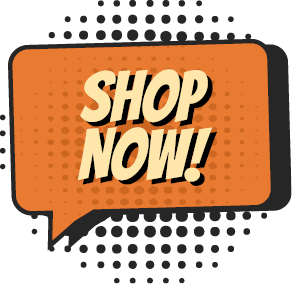 I don’t pretend to be a merchant of cheap lighting, I work hard to achieve a high level product that reflects the amount of money, time and effort that you spend on what you’re displaying and think of your collection as being my own and how I would kit it out. 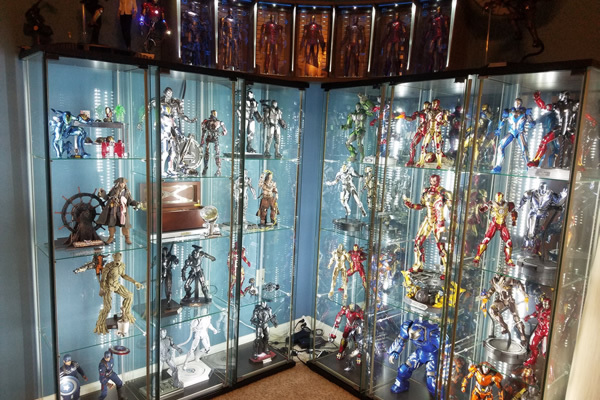 Here’s a couple of examples of the IKEA Detolf glass cabinets I have lit over the last few years. I’m sure you’ll agree that the collections are impressive and they are made even more so by decent lighting that ties everything together. I’ve worked with many different types of collectors over the years. My own passion lies in collecting high end toys, in particular, collectible toys that have a distinct likeness toward their onscreen counterparts. 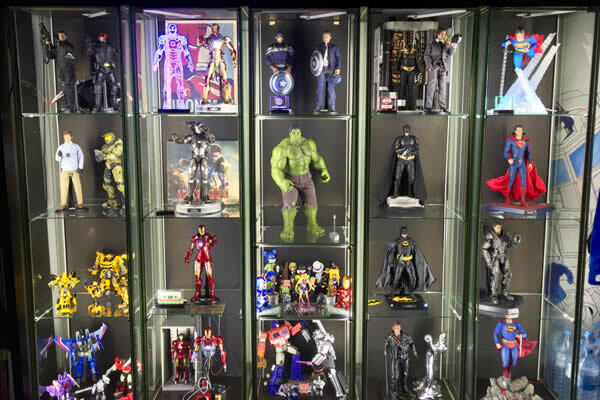 Whether it’s Hot Toys, Sideshow, Medicom or Hasbro, whether it’s superheroes, army soldiers, Transformers or TV & film stars, I love these movie masterpiece, scale figures, statues and replicas and it’s a collecting addiction that’s fuelled my passion over the years. 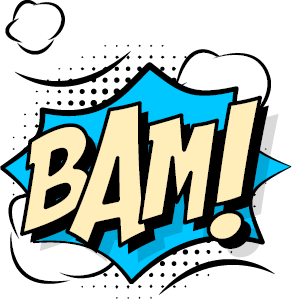 But I’ve also worked with rock and geode collectors, boxing memorabilia collectors, model aircraft enthusiasts, sculptors and artists, jewellery stores and other retail shops. I’ve even lately moved into producing lighting for kitchens, beach huts and campervans. 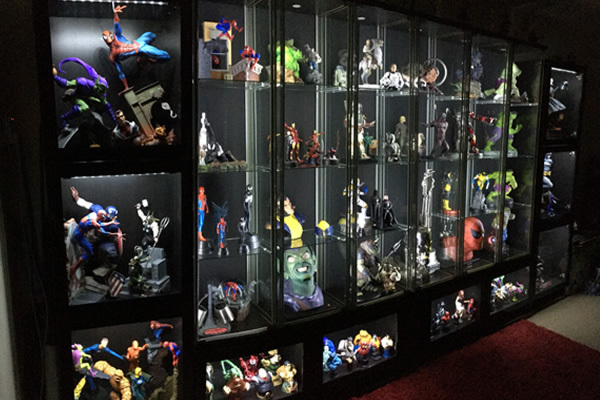 I pride myself on creating lighting that works for you, regardless of whether you are a collector, retailer or any other environment you could possibly be in. I love a clean crisp display with lighting that suits what’s inside the cabinet. Where lighting isn’t what you see, but is enhancing what it is you’re supposed to be seeing. And that’s my story. My custom built IKEA Detolf LED lighting kits install quickly and easily with next to no visible wiring or LED strips on view. Pop over to my shop or read more about the lighting kits here. 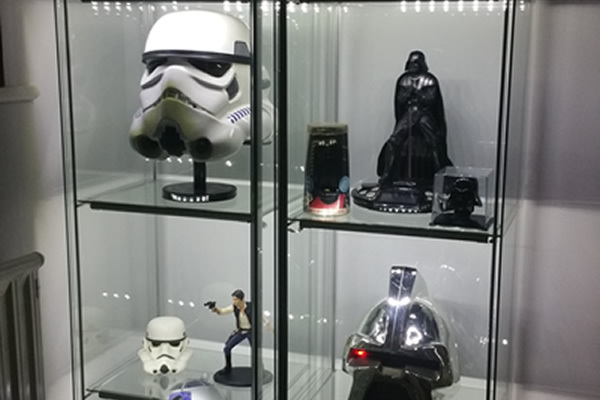 Your IKEA Detolf can be enhanced with a customised lighting kit… specifically designed to hide any unsightly wiring and focus all the light on your collection. A personal service is guaranteed from enquiry to installation with support and video guidance available at every step. Wherever you are in the world, Your custom lighting kit for your IKEA Detolf glass cabinet or whatever else you’re lighting is shipped as a priority once hand-built. Have a query about my Ikea Detolf LED lighting kits or any other lighting needs? Get in touch and I will be happy to chat about the right design for you. TCC is a Registered Trade Mark.